Low flow and high flow couplers, from 6 to 40 litres/min. 700 and 1.000 bar couplers have 3/8″ NPT theread. 1.500 bar couplers have 1/4″-BSP thread. Male and Female couplers can be supplied separately. AZ3120, AZ3140 and AZ3141: standard high flow couplers. AZ3220 and AZ3240: low flow couplers, only used in maintenance units. All standard cylinders are supplied with AZ3140 female coupler. All cutters are supplied with AZ3321 male ball coupler. 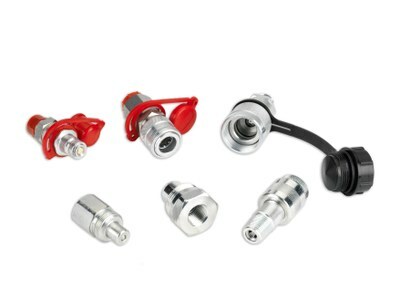 AZ3321, AZ3322, AZ3324, AZ3325, AZ3341, AZ3344 and AZ3345: ball quick couplers, to guarantee easy and quick connection. Maximun working pressure 1.000 and 1.500 bar. AZ3321, AZ3322, AZ3324 and AZ3325 male couplers are connectable with AZ3341, AZ3344 and AZ3345 female couplers. Plastic dust cup AZ3103 available to suit AZ3120, AZ3140 and AZ3141 couplers. Steel dust cup available. AZ3124 for AZ3120 male coupler and AZ3144 for AZ3140 female coupler. 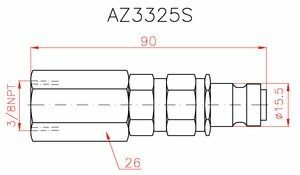 AZ3325S reference has a safety special valve that close automatically in the event of a hose broken or when the flow is over 13 l/min. This reference AZ3325S has a safety special valve that close automatically in the event of a hose broken or when the flow is over 13 l/min.